This is the official picture (complete with photoshopped Macy's banner) from our trip last weekend. I took a few of my own as well but need to finish the roll of film first. This bit of cuteness is to tide us all over until I do. Santa is truly awesome and he kept the Santaland machine running perfectly while still making the girl feel special. She retains that particular brand of awe, at least for this year, and she asked for 2 very specific things (one was a a sewing kit but I can't remember what the other thing was) and gave him a very sincere hug. The picture of the hug is the one I really hope comes out. How freaking cute is this, huh? That is so cute. I don't think I am going to get a Santa pic this year. 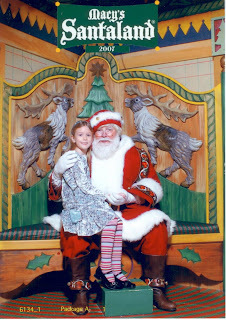 My 9 year old still believes, but she is too shy to talk with Santa in person. I'd say it was pretty freakin' cute. Love the tights! The girl is 6.5, Chili. Do you HAVE to have an outright conversation about it? I mean, she'll know on her own without having to have the bubble very specifically burst, won't she? My mother and I still keep the fiction alive for each other even though we each know that the other is just playing along. Seester, Alita always gets a little shyer when she's confronted with Santa specifically but she conquers it. Mrs. G., her mom had laid out a lovely outfit for her with a black dress and some one color tights and whatnot. It was summarily rejected in favor of the devil may care ensemble you see in the picture. She was disappointed, though, that her purse didn't look shiny enough in the photo. It's much shinier in person. I've finished my roll of film, looking forward to getting it processed and posted before Christmas.